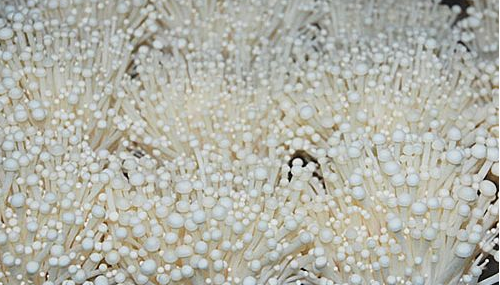 During the process of Enoki mushroom cultivation, one of the most troubling phenomenons might be thin and slow growth on mycelia, to analyze the cause, insufficient nutrient in substrate might be the chief culprit. Enzyme secreted by mycelia of Enoki mushroom dissolves cellulose of the wood while it is unable to directly break down Lignin. As a consequence, in the case of artificial cultivation, it is necessary to reasonably match substrates so as to meet the needs on growth of Enoki mushroom, especially in event of large-scale cultivation with sawdust or other substitutive substrates, 10%-20% of fine rice bran, wheat bran or nitrogen should be added. Substrate should be prepared to a moderate humidity, excess humidity might cause halfway spawn-running or slow growth while overdried substrate results in tardy and thin growth of mycelia, and finally, be sure to evenly fill up substrate in bags, too-tight or too-loose bagging undoubtedly influences the growth of mycelia.